Photography [fә'tɑgrәfi:],[foʊ'tɑgrәfi:] is the process of recording pictures by means of capturing light on a light-sensitive medium, such as a sensor or film. Light patterns reflected or emitted from objects expose a sensitive chemical or electronic medium during a timed exposure, usually through a photographic lens in a device known as a camera that also stores the resulting information chemically or electronically. The camera or camera obscura is the image-forming device, and photographic film or a digital storage card is the recording medium. Photographers control the camera and lens to "expose" the light recording material (usually film or a charge-coupled device; a complementary metal-oxide-semiconductor may also be used) to the required amount of light. After processing, this produces an image. 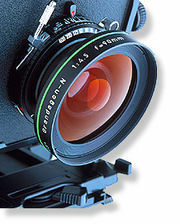 Aperture of the lens – adjustment of the iris, measured as f-number, which controls the amount of light entering the lens. Aperture also has an effect on focus and depth of field, namely, the smaller the opening [aperture], the less light but the greater the depth of field--that is, the greater the range within which objects appear to be sharply focused. Shutter speed – adjustment of the speed (often expressed either as fractions of seconds or as an angle, with mechanical shutters) of the shutter to control the amount of time during which the imaging medium is exposed to light for each exposure. Shutter speed may be used to control the amount of light striking the image plane; 'faster' shutter speeds (that is, those of shorter duration) decrease both the amount of light and the amount of image blurring from subject motion or camera motion. White balance – on digital cameras, electronic compensation for the colour temperature associated with a given set of lighting conditions, ensuring that white light is registered as such on the imaging chip and therefore that the colors in the frame will appear natural. On mechanical, film-based cameras, this function is served by the operator's choice of film stock. In addition to using white balance to register natural coloration of the image, photographers may employ white balance to aesthetic end, for example white balancing to a blue object in order to obtain a warm colour temperature. Metering – measurement of exposure at a midtone so that highlights and shadows are exposed according to the photographer's wishes. Many modern cameras feature this ability, though it is traditionally accomplished with the use of a separate light metering device. ISO speed – traditionally used to set the film speed of the selected film on film cameras, ISO speeds are employed on modern digital cameras as an indication of the system's gain from light to numerical output and to control the automatic exposure system. A correct combination of ISO speed, aperture, and shutter speed leads to an image that is neither too dark nor too light. Auto-focus point – on some cameras, the selection of a point in the imaging frame upon which the auto-focus system will attempt to focus. Many SLR cameras feature multiple auto-focus points in the viewfinder. Inherent sensitivity of the medium to light intensity and colour/wavelengths. Camera controls are inter-related, the total amount of light reaching the film plane (the "exposure") changes with the duration of exposure, aperture of the lens, and focal length of the lens (which changes as the lens is zoomed). Changing any of these controls alters the exposure. Many cameras may be set to adjust most or all of these controls automatically. This automatic functionality is useful in many situations, and in most situations to occasional photographers. The duration of an exposure is referred to as shutter speed, often even in cameras that don't have a physical shutter, and is typically measured in fractions of a second. Aperture is expressed by an f-number or f-stop (derived from focal ratio), which is proportional to the ratio of the focal length to the diameter of the aperture. If the f-number is decreased by a factor of , the aperture diameter is increased by the same factor, and its area is increased by a factor of 2. The f-stops that might be found on a typical lens include 2.8, 4, 5.6, 8, 11, 16, 22, 32, where going up "one stop" doubles the amount of light reaching the film, and stopping down one stop halves the amount of light. Exposures can be achieved through various combinations of shutter speed and aperture. For example, f/8 at 1/125th of a second and f/4 at 1/500th of a second yield the same amount of light. The chosen combination has an impact on the final result. In addition to the subject or camera movement that might vary depending on the shutter speed, the aperture (and focal length of the lens) determine the depth of field, which refers to the range of distances from the lens that will be in focus. For example, using a long lens and a large aperture (f/2.8, for example), a subject's eyes might be in sharp focus, but not the tip of the nose. With a smaller aperture (f/22), or a shorter lens, both the subject's eyes and nose can be in focus. With very small apertures, such as pinholes, a wide range of distance can be brought into focus. Image capture is only part of the image forming process. Regardless of material, some process must be employed to render the latent image captured by the camera into the final photographic work. This process consists of two steps, development, and printing. 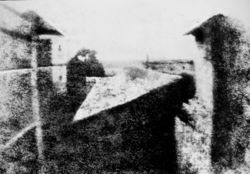 Nicéphore Niépce's earliest surviving photograph, c. 1826. This image required an eight-hour exposure, which resulted in sunlight being visible on both sides of the buildings. Meanwhile, Hercules Florence had already created a very similar process in 1832, naming it Photographie, and William Fox Talbot had earlier discovered another means to fix a silver process image but had kept it secret. After reading about Daguerre's invention, Talbot refined his process so that it might be fast enough to take photographs of people. By 1840, Talbot had invented the calotype process, which creates negative images. John Herschel made many contributions to the new methods. He invented the cyanotype process, now familiar as the "blueprint". He was the first to use the terms "photography", "negative" and "positive". He discovered sodium thiosulphate solution to be a solvent of silver halides in 1819, and informed Talbot and Daguerre of his discovery in 1839 that it could be used to "fix" pictures and make them permanent. He made the first glass negative in late 1839. All photography was originally monochrome, or black-and-white. Even after color film was readily available, black-and-white photography continued to dominate for decades, due to its lower cost and its "classic" photographic look. In modern times, black-and-white has mostly become a minority art form, and most photography has become colour photography. Colour photography was explored throughout the late 1800s and early 1900s. Early experiments in color could not fix the photograph and prevent the color from fading. The first permanent colour photo was taken in 1861 by the physicist James Clerk Maxwell. One of the early methods of taking color photos was to use three cameras. Each camera would have a colour filter in front of the lens. This technique provides the photographer with the three basic channels required to recreate a colour image in a darkroom or processing plant. 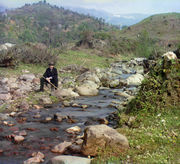 Russian photographer Sergei Mikhailovich Prokudin-Gorskii developed another technique, with three colour plates taken in quick succession. Practical application of the technique was held back by the very limited colour response of early film; however, in the early 1900s, following the work of photo-chemists such as H. W. Vogel, emulsions with adequate sensitivity to green and red light at last became available. The first colour plate, Autochrome, invented by the French Lumière brothers, reached the market in 1907. It was based on a 'screen-plate' filter made of dyed dots of potato starch, and was the only colour film on the market until German Agfa introduced the similar Agfacolor in 1932. In 1935, American Kodak introduced the first modern ('integrated tri-pack') colour film, Kodachrome, based on three colored emulsions. This was followed in 1936 by Agfa's Agfacolor Neue. Unlike the Kodachrome tri-pack process the color couplers in Agfacolor Neue were integral with the emulsion layers, which greatly simplified the film processing. Most modern colour films, except Kodachrome, are based on the Agfacolor Neue technology. Instant colour film was introduced by Polaroid in 1963. As an interesting side note, the inventors of Kodachrome, Leopold Mannes and Leopold Godowsky, Jr. were both accomplished musicians. Godowsky was the brother-in-law of George Gershwin and his father was Leopold Godowsky, one of the world's greatest pianists. Colour photography may form images as a positive transparency, intended for use in a slide projector or as color negatives, intended for use in creating positive color enlargements on specially coated paper. The latter is now the most common form of film (non-digital) colour photography owing to the introduction of automated photoprinting equipment. Traditional photography burdened photographers working at remote locations without easy access to processing facilities, and competition from television pressured photographers to deliver images to newspapers with greater speed. Photo journalists at remote locations often carried miniature photo labs and a means of transmitting images through telephone lines. In 1981, Sony unveiled the first consumer camera to use a charge-coupled device for imaging, eliminating the need for film: the Sony Mavica. While the Mavica saved images to disk, the images were displayed on television, and the camera was not fully digital. 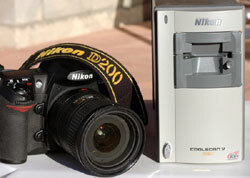 In 1990, Kodak unveiled the DCS 100, the first commercially available digital camera. Although its high cost precluded uses other than photojournalism and professional photography, commercial digital photography was born. Digital imaging uses an electronic image sensor to record the image as a set of electronic data rather than as chemical changes on film. The primary difference between digital and chemical photography is that analog photography resists manipulation because it involves film, optics and photographic paper, while digital imaging is a highly manipulative medium. This difference allows for a degree of image post-processing that is comparatively difficult in film-based photography, permitting different communicative potentials and applications. Digital imaging is rapidly replacing film photography in consumer and professional markets. Digital point-and-shoot cameras have become widespread consumer products, outselling film cameras, and including new features such as video and audio recording. Kodak announced in January 2004 that it would no longer produce reloadable 35 mm cameras after the end of that year. This was interpreted as a sign of the end of film photography. However, Kodak was at that time a minor player in the reloadable film cameras market. In January 2006, Nikon followed suit and announced that they will stop the production of all but two models of their film cameras: the low-end Nikon FM10, and the high-end Nikon F6. On May 25, 2006, Canon announced they will stop developing new film SLR cameras. Because photography is popularly synonymous with truth ("The camera doesn't lie. "), digital imaging has raised many ethical concerns. Many photojournalists have declared they will not crop their pictures, or are forbidden from combining elements of multiple photos to make "illustrations," passing them as real photographs. Many courts will not accept digital images as evidence because of their inherently manipulative nature. Today's technology has made picture editing relatively easy for even the novice photographer. Advertising photography: photographs made to illustrate a service or product. These images are generally done with an advertising agency, design firm or with an in-house corporate design team. Photojournalism: this can be considered a subset of editorial photography. Photographs made in this context are accepted as a truthful documentation of a news story. Many people take photographs for self-fulfillment or for commercial purposes. 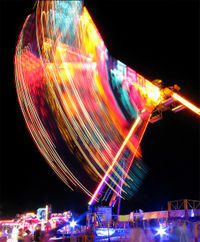 Organizations with a budget and a need for photography have several options: they can assign a member of the organization or hire someone to shoot exactly what thay want, run a public competition, or obtain rights to stock photographs either through traditional stock giants, such as Getty Images, or through smaller microstock agencies, such as Fotolia. During the twentieth century, both fine art photography and documentary photography became accepted by the English-speaking art world and the gallery system. In the United States, a handful of photographers spent their lives advocating for photography as a fine art. 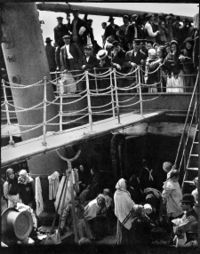 Alfred Stieglitz, Edward Steichen, John Szarkowski, and Edward Weston the most prominent among them. The aesthetics of photography is a matter that continues to be discussed regularly, especially in artistic circles. Many artists argued that photography was the mechanical reproduction of an image. If photography is authentically art, then photography in the context of art would need redefinition, such as determining what component of a photograph makes it beautiful to the viewer. The controversy began with the earliest images "written with light": Nicéphore Niépce, Louis Daguerre, and others among the very earliest photographers were met with acclaim, but some questioned if it met the definitions and purposes of art. There must be some one quality without which a work of art cannot exist; possessing which, in the least degree, no work is altogether worthless. What is this quality? What quality is shared by all objects that provoke our aesthetic emotions? What quality is common to Sta. Sophia and the windows at Chartres, Mexican sculpture, a Persian bowl, Chinese carpets, Giotto's frescoes at Padua, and the masterpieces of Poussin, Piero della Francesca, and Cezanne? Only one answer seems possible - significant form. In each, lines and colors combined in a particular way, certain forms and relations of forms, stir our aesthetic emotions. The camera has a long and distinguished history as a means of recording phenomena from the first use by Daguerre and Fox-Talbot, such as astronomical events (eclipses for example) and small creatures when the camera was attached to the eyepiece of microscopes (in photomicroscopy). The camera also proved useful in recording crime scenes and the scenes of accidents, one of the first uses being at the scene of the Tay Rail Bridge disaster of 1879. The set of accident photographs was used in the subsequent court of inquiry so that witnesses could identify pieces of the wreckage, and the technique is now commonplace in courts of law. Besides the camera, other methods of forming images with light are available. For instance, a photocopy or xerography machine forms permanent images but uses the transfer of static electrical charges rather than photographic film, hence the term electrophotography. Rayographs published by Man Ray and others are images produced by the shadows of objects cast on the photographic paper, without the use of a camera. Objects can also be placed directly on the glass of an image scanner to produce digital pictures.